2018 Ozone Camellia Club Queen Ava Bijeaux, crowned by the previous year’s queen, Mary Elizabeth Dowden. 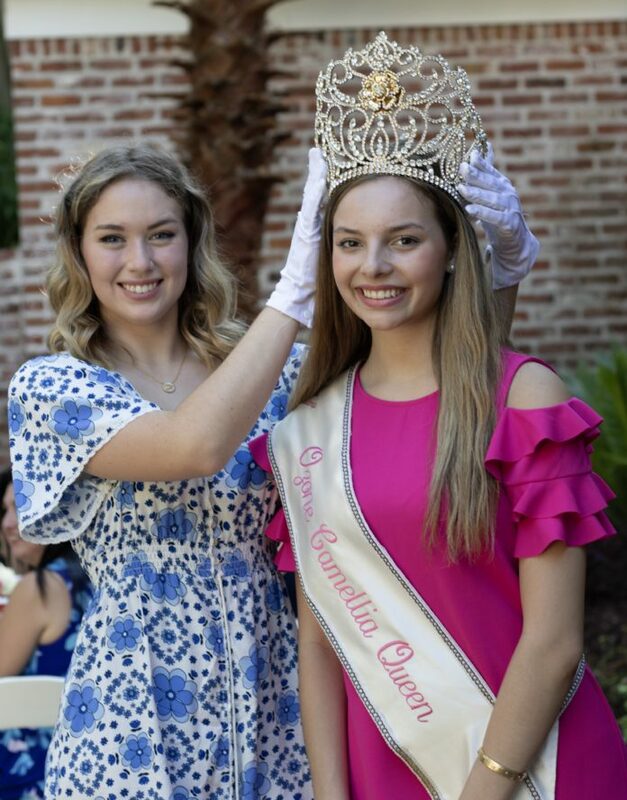 Ava Kathryn Bijeaux of Natchitoches was recently presented as the 2018 Queen of the Ozone Camellia Club at a garden party social in her honor. Bijeaux is a senior at Natchitoches Central High School, where she is a member of the National Honor Society, FBLA member and past member of Maroon Dance Line and Chiefettes. She is a member of Summer Dance Committee, Calico Belles Service Organization and is a member of the Minor Basilica of the Immaculate Conception Church. She is the daughter of Amy Elizabeth Deason and the granddaughter of Delores and Richard Deason of Kisatchie. In front is Crown-bearer Madelyn Black. In back from left are Brent Fuselier, Gabrielle Devereux, Patrick Tonglet, Queen Ava Bijeaux, Consort Matthew Parks, McKenzie Fugate, Eric Toups and Sydney Rohlinger. As queen of the Ozone Camellia Club, Bijeaux will reign over the 68th annual St. Tammany Ozone Camellia Festival Saturday, Dec. 1 at the Slidell City Auditorium. The festival includes a camellia flower show, student art competition and presentation of the Camellia Court. She will also represent the state of Louisiana as a visiting queen to the 2019 Washington D.C. Mardi Gras. 2018 Ozone Camellia Club Queen Ava Bijeaux and her mother, Amy Elizabeth Deason. The Ozone Camellia Club, located in Slidell, was established in 1951 to stimulate the appreciation of camellias, to promote the science of camellia culture and to encourage the public and private growing of camellias. It is one of the largest organizations of its kind, with a membership of over 300. Ava is sponsored by her aunt and uncle, Don and Debra Deason Derham of Slidell.